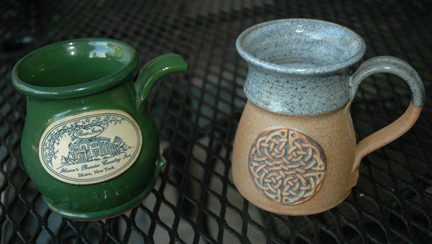 Continuing on the topic of ‘mug collecting’ is at the center story of today’s blog… This one is a good one about the custom handmade mugs that we proudly create! Did you say all 50 states?!? Vince first contacted us back in April of 2009 when he was looking to replace a round belly mug that he purchased years ago from the Rose Hill Inn (read that story here). Because the Inn was destroyed in a horrible fire, and it has not yet reopened, replacing that mug seemed impossible. “Unfortunately, the mug was broken beyond recognition, I know that’s hard to believe since they are so sturdy.” Here is a picture of that broken Rose Hill Inn mug, along with a distant ‘cousin’ mug from Scotland that Vince picked up on a vacation years before he knew anything about Deneen Pottery. 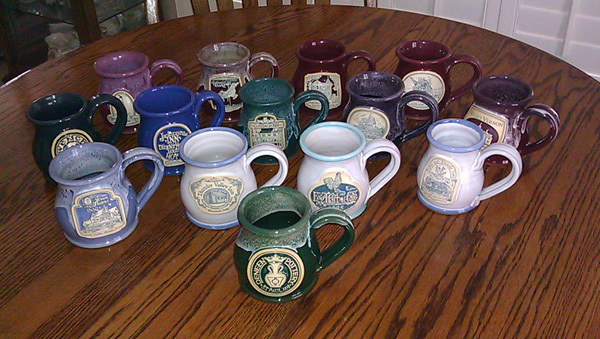 As fortune would have it, while sorting out samples for the Paii Conference at the start of they year I found a random box of samples… And inside of that box was… Yep, you guessed it, a lone Rose Hill Inn mug!?! Upon the suggestion of our newest employee, Heath Croft [Director of Social Media, Sales], we packed up that mug and quietly sent it to Vince, this was his reply. It’s been a pleasure working with you, Vince! We look forward to hearing back about your collection as it grows!! !